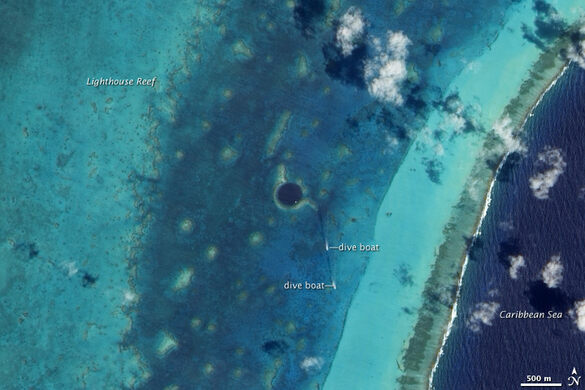 The Great Blue Hole, located just 100 kilometers (60 miles) off the coast of Belize, is an underwater sinkhole that researchers believe is the largest of its kind. A devastated ruin in the south of Belize where British explorers claimed to unearth the Mitchell-Hedges Crystal Skull. Circular in shape and characterized by its rich, blue color, it is over 300 meters (984 ft) across and 125 meters (410 ft) deep. It lies in the center of an atoll called Lighthouse Reef, where an island of coral encircles the shallow, light turquoise-colored waters of a lagoon. Water levels there are so shallow that parts of the ring surrounding the dark blue sinkhole are even known to crest the surface at low tide. The sinkhole originally formed as a limestone cave during the last glacial period, a time when sea levels were much lower. As the ocean began to rise, the cave system flooded and eventually collapsed, creating a “vertical cave” in the ocean. 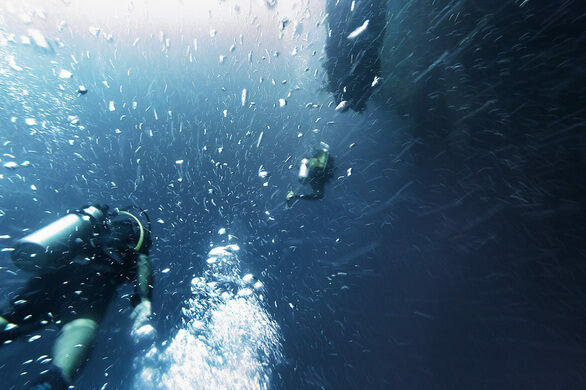 As such, the site is popular among divers, who flock to the area to see the geological formations that now lie in the ocean’s depths. It’s possible to dive all year round, however, April to June is considered to be the prime time for better visibility and spotting whale sharks in the area. One such diver was undersea explorer Jacques Cousteau, who made the site famous in 1971 by declaring it one of the top ten best diving places in the world. At the time, Cousteau, sailing on his ship Calypso, investigated the sinkhole’s depths and confirmed that it had, indeed, originated from a limestone cave formation. Huge stalactites and stalagmites were also found below the surface, some even reaching 9-12 meters (30-40 ft) in length. They say, Ned Middleton, a British diver and author, gave the name to the Hole referring to Australia’s Great Barrier Reef. These geological formations can still be viewed by divers today. It is said that the deeper one goes, the water becomes more clear and the formations, more complex. 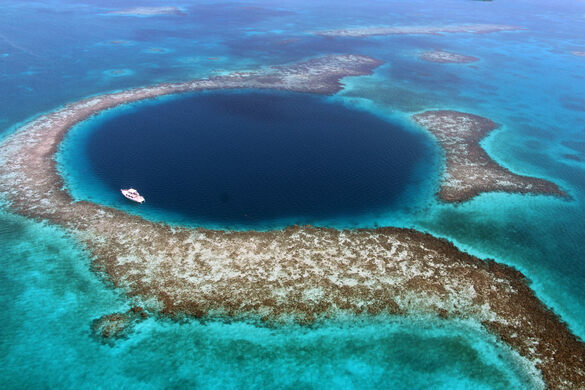 The Great Blue Hole is part of the larger Belize Barrier Reef Reserve System, a World Heritage Site of the United Nations Educational, Scientific and Cultural Organization (UNESCO). Some dive tours can be booked out of hotels on Long Caye and the Turneffe Islands, Ambergris Caye, Caye Caulker and Belize City. The Great Blue Hole diving is not allowed to everyone, the prerequisite is more than 24 complete dives. Snorkeling at the top of the Hole is allowed, and as it is bordered by a reef, there is wildlife to see by simply snorkeling.